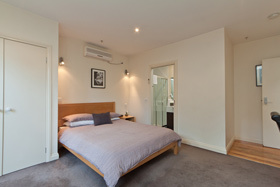 Sixty Two on Grey offers 3.5 star quality accommodation in the heart of St Kilda. Our property consists of 12 fully self contained STUDIO apartments which are beautifully decorated and are all very private. Built in the 1860’s, this Georgian Mansion still preserves its original character and has been designed for those who prefer to stay in apartment living rather than hotel style. You will enjoy the “high level of privacy” and also the “self check-in system” that saves you time and is excellent for late arrivals. Modern self contained budget room with kitchenette including Microwave, Bar Fridge, Electric hotplates, kitchen utensils and tea and coffee facilities. Facilities include 1 Queen bed, heating/air conditioning, Flat Screen TV, DVD player, Iron and Ironing Board, Desk and FREE Wifi/Broadband in room and public areas. Balconies are available and are subject to availability. Room sleeps 2 people only. Larger spacious apartments with kitchenette including Microwave, Bar Fridge, Electric hotplates, kitchen utensils and tea and coffee facilities. 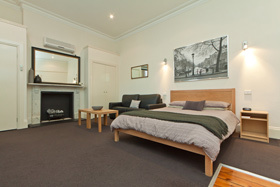 Facilities include 1 Queen bed, heating/air conditioning, Flat Screen TV, DVD player, Desk, Iron and Ironing Board and FREE Wifi/Broadband in room and public areas. May sleep a third person on sofabed or rollaway bed. Rates are for 2 people only. Extra $30 charge applies to third person. Please also check availability prior to booking.